A local woman intends to distribute small boxes adorned with colorful drawings of endangered species at the Bloomington Community Farmers Market Saturday. Inside the eye-catching packages are two condoms. 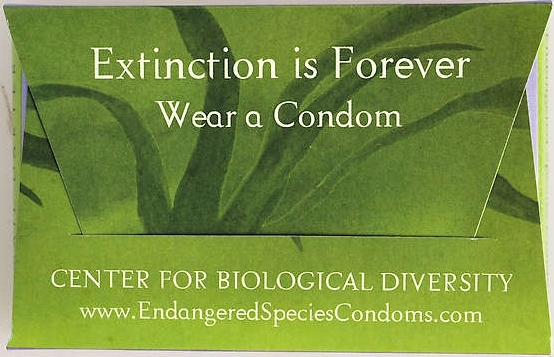 Terri Greene received them from the Center for Biologic Diversity in its attempt to link extinction of many species to the increase in one species: Homo sapiens. According to the nonproft organization Population Connection, formerly called Zero Population Growth, the global human population growth rate has fallen in the past few decades, but the birth rate worldwide is 2.6, which means the population is still growing. Fast. At this rate, the world’s population will grow from 6.8 billion today to 11 billion by 2050, the group says. Replacement level, required for the Earth’s population to stabilize, is a birth rate of 2.1 children per woman.